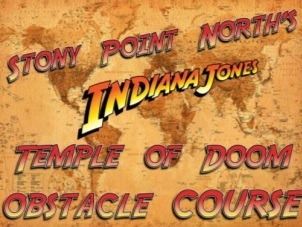 Students in Kindergarten through 5th grades have been participating in a fun, physical, and challenging activity in their PE classes as they have participated in our “Stony Point North’s Indiana Jones Temple of Doom” Obstacle Course. This has been a yearly activity with students looking forward to the "challenging obstacle course every year! During each student’s trip through our “Indiana Jones Temple of Doom Obstacle Course”, they have worked on improving a variety of physical skills including improving their balance, agility, strength, and coordination. Each student journey through the obstacle course has the student using their imagination as they take on "all obstacles and physical challenges", especially the "dreaded snakes and alligators" on the course!! As students “Jumped over the Rocks (hurdles)”, they utilized the skills of running, leaping, and jumping. Students developed their physical skills in agility, balance and coordination as they traveled through the “mountain” (mats with a large parachute over the top of the tumbling mats) by riding in their “mine carts” ( sitting and moving on scooter boards). Two “very high Bridges of Danger” (balance beams 6 - 10 inches above the floor) required students to balance themselves above more “snakes and alligators”. Students then faced the "ultimate challenge" as they finished the obstacle course when they climbed the “very high treacherous mountain, Mount Stony Point” (rock climbing wall, students walking on the rocking climbing wall 2 - 4 feet above the floor with a mat below) over more “snakes and alligators”. Students were able to repeat this "exciting, dangerous adventure" as they heard the Indiana Jones theme song playing throughout the class period with lights flashing from a "dangerous storm" (lights in gym being turned on and off). Needless to say, our obstacle course, with the use of all our students imagination has been one of our students very favorite activities EVERY YEAR! !